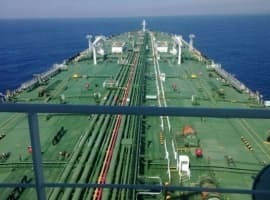 OPEC said that the global oil supply surplus has nearly been eliminated, although the group is shifting its sights on lack of investment in upstream supply. In OPEC’s May Oil Market Report, the group noted that non-OPEC supply continues to grow at a rapid rate, adding 0.87 million barrels per day (mb/d) in 2017, with expectations of another 1.7 mb/d in 2018, 89 percent of which will come from the U.S. In fact, non-OPEC supply is expected to outpace demand growth, even though demand will expand by a robust 1.65 mb/d this year. 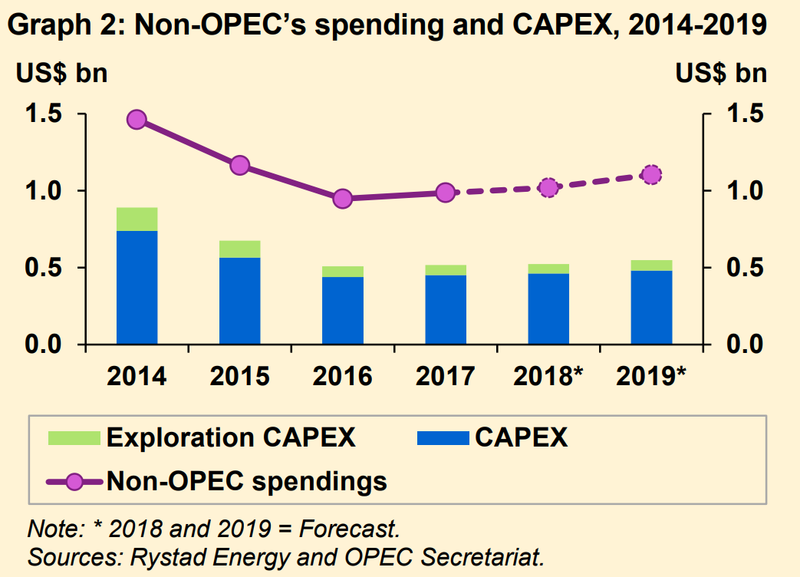 But OPEC also warned that “non-OPEC capital expenditure (CAPEX), including exploration, increased by only 2% y-o-y. 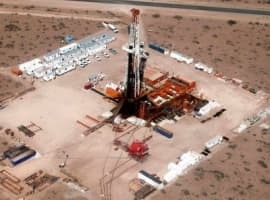 Moreover, it has seen a decline of around 42% compared to the 2014 level.” While that seems like a bit of a throw-away line given the enormous production increases from U.S. shale, the focus on upstream investment has been a growing point of emphasis for OPEC as it grapples with how to respond to a tightening oil market. Commercial stocks were only 9 million barrels above the five-year average in March, which is to say, stocks are probably already below the five-year average at this point. That means that OPEC has achieved its goal of shrinking the supply surplus. Keeping the cuts in place for the remainder of 2018 (OPEC’s initial preference) would seem to require another justification now that inventories are back to the five-year average. Raising alarms about lack of upstream investment could offer such a pretext. Moreover, OPEC noted that heady projections about U.S. shale growth are not without downside risk. U.S. shale could fail to deliver on aggressive growth figures for several reasons. "The continued strong development of the world economy could lead to rising inflation, and, along with potential trade restrictions, would impact oil production costs," OPEC said. "In addition, fast-growing US tight oil production is increasingly faced with costly logistical constraints in terms of outtake capacity from land-locked production sites." Meanwhile, the U.S. decision to scrap the Iran nuclear deal looms over the oil market and OPEC’s deliberations. Any supply outage could force OPEC off of the sidelines, whether they want to act or not. In that sense, the cartel might be compelled to make changes to the deal to allow for more supply in the event of declining shipments from Iran. OPEC and Russian officials have intimated that they would not let a supply outage rattle the market. "It is too early to say [what the impact of the US decision on the oil market will be]. In any case, we have all the tools that could be used to balance the market," Russia’s energy minister Alexander Novak said. In OPEC’s monthly report, the group also stated that it “stands ready to support oil market stability, together with non-OPEC oil producing nations” participating in the agreement. OPEC added a minor 12,000 bpd between April and March, with the loss of 41,000 bpd from Venezuela offset by the 46,500 bpd increase from Saudi Arabia. That's pure 24 kt. BS! The U.S. is still sitting on around 430 million barrels of oil in active inventory. 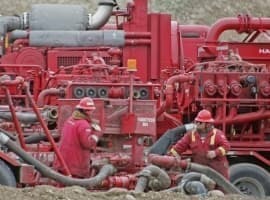 That's over 100 million more that any time in history.The U.S. is on course to reach 10 million barrels a day production,a record.The fuel mileage on cars keeps rising.The oil dependent producer nations,in spite of what they say,haven't cut back on production because they desperately need the revenue. It all,once again,falls back to the huge supply of "free money" available to fuel speculators' greed.As long as interest rates remain artificially near zero,and "virtually free money" readily available to only a select few,greed will be the order of the day.There is more than plenty of oil,both pumped,being pumped,and ready to be pumped. Steve, adjusted for population or energy demand, it's not a record level of inventories. Supply is plentiful because a number of 1-time dislocations from 5-6 years ago -- Libya, Nigeria, Iraq, Iran, etc. -- have all reversed to the upside. Iraq alone has doubled production from 10 years ago. Without Russia and Saudi Arabia taking barrels off the table, we'd probably be $15 bbl. lower. Oil is not the game anymore, well, not the game as it once was. Rothschild and The District of Columbia see a time soon when there won't be so many people, when there won't be so many people needing oil products, gas and plastic, a time when transportation is more in the form of electric, the need for packaging and all that entails reduced so that it can be handled with other materials and in other ways. The use of oil and the products made from oil have nearly destroyed the earth, have made the environment unhealthy, are more a threat to life than of benefit to it. The continued use of oil as a fuel and products made from oil are a direct and deadly threat to the Earth the Wealthy Elite and their Banker King see in the future, see for themselves and their children. Something must and something, will give, very soon. I can see the populations in the Middle East, someday, soon, living like the Africans in the desert states and war devastated states in Africa, live, that is, eating the roots from the ground, ensuring the plants cannot reproduce, ie, starvation. I can find no evidence of peoples of the far distant ancient past, the sophisticated civilizations, the people who constructed the megaliths and managed the lives of billions of people, long ago. I can see no evidence of them needing or using Oil as the populations of earth have used oil these last few hundred years, maybe they had grown past the need for the messy stuff that oil produces, for the stuff that snuffs life out and destroys environments, like a plague destroys life. Their lives more of food and stone, frequencies and seasons, allowed, the desire for gold was a flaw in the civilizations leadership, the insane and constant over breeding of the humans, a, tragedy. Still, what we people living today inherited was not a swamp of dangerous chemicals and poisons, we inherited a Earth clean and fit, strong and secure, which, we in such a short time have nearly destroyed, all by ourselves. What happened to the 2 years of oversupply in floating storage around the world we had 6 months ago..?